Winterize Old Windows & Doors Now! 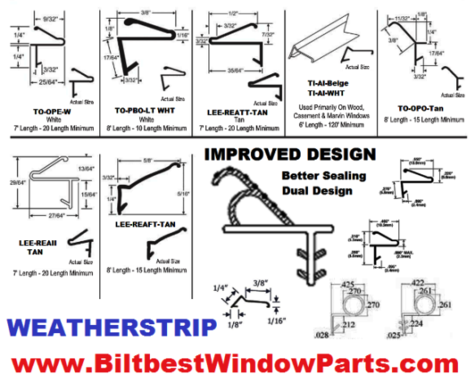 .. replace that old window and door weather-strip, maybe that old glazing bead is letting in that cold air and artic blasts .. we have all your window and door replacement parts, weatherstripping, door bottom sweep seals, door-weatherstrip, foam type window seals and many "upgrades" for those old Aluminum Windows, Vinyl Windows, Wood Windows, Clad Windows from Marvin and Integrity, Anderson, Wenco, Peachtree, Pella, American Craftsman, Andersen, Integrity from Marvin, Jeld-Wen, Kolbe & Kolbe, Lincoln, Pella, Ply Gem, Reliabilt, Simonton, Weather Shield, Biltbest, Caradco, Norandex, Norco, Rockwell, Seal-Rite, Pozzi, Sealtrite, Semco, SNE, Vedder, MW, Hurd, Craftline, Weathervane, Wenco, Weathershield, Windsor, Malta and others. Need Help? .. Send Pics? ..